According to rental site Zumper, median rents for a 1-bedroom in San Francisco are hovering around $3,295. But how does the low-end pricing on a San Francisco rental look these days--and what might you get for your money? We took a look at local listings for studios and 1-bedroom apartments to find out what price-conscious apartment seekers can expect to find. 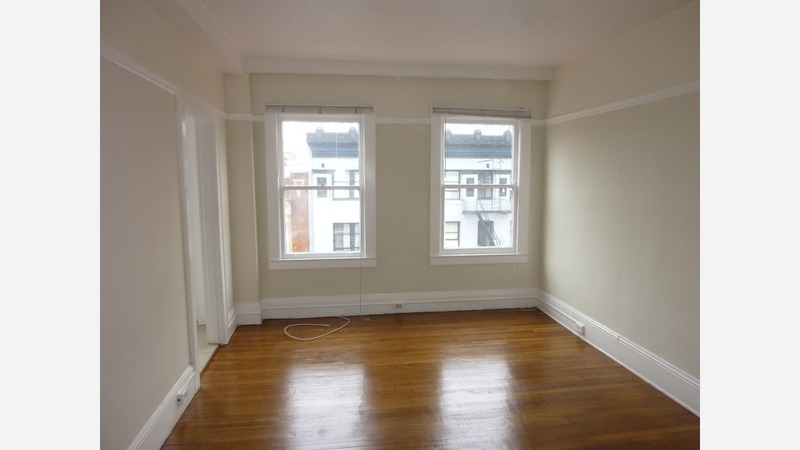 Listed at $1,575 / month, this studio apartment is located at 513 Bush St. in Downtown / Union Square. Building amenities include on-site laundry, secured entry and on-site management . In the unit, expect high ceilings, central heating, carpeted floors, a walk-in closet and a ceiling fan. Cats and dogs are not welcome. According to Walk Score, the area around this address is extremely walkable, is very bikeable and boasts excellent transit options. And here's a studio apartment at 765 Geary St. in the Tenderloin, which is going for $1,595 / month. The apartment features hardwood floors, a small refrigerator, built-in shelves and closet space. Pet owners will be happy to hear that cats and dogs are welcome in this unit. According to Walk Score's assessment, the area around this address is a "walker's paradise," is quite bikeable and is a haven for transit riders. Over at 1499 California St. in Nob Hill, there's this studio apartment, going for $1,650 / month. The studio features hardwood floors, a large closet and a residents lounge. Pets are not allowed in this listing. Per Walk Score ratings, this location is extremely walkable, is very bikeable and has excellent transit. Listed at $1,825 / month, this 400-square-foot studio apartment is located at 765 O'Farrell St. in the Tenderloin. Building amenities include on-site laundry, outdoor space, on-site management, an elevator and a bike rack. In the unit, expect high ceilings, hardwood flooring, a walk-in closet, granite countertops and maple cabinets. Attention, cat owners: your kitty is welcome here. According to Walk Score, this location is extremely walkable, is quite bikeable and is a haven for transit riders. To wrap things up, there's this studio apartment at 669 Ellis St. in the Tenderloin. It's being listed for $1,845 / month. The apartment comes with hardwood floors, stainless steel appliances, a dishwasher, in-unit laundry and bay windows. Pets are not permitted in this unit. According to Walk Score's assessment, this location has excellent walkability, is a "biker's paradise" and has excellent transit.